The Economist recently ran an article about suicide in the United States, which presented a chart showing a strong positive association between suicide rate and gun ownership across US states. This led me to wonder whether a similarly strong association exists between homicide rate and gun ownership. 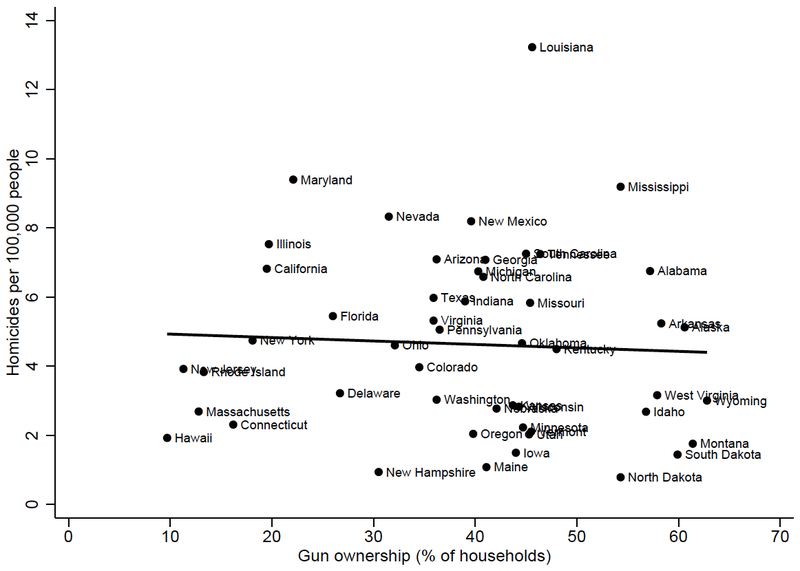 I took data on gun ownership from the same source as The Economist, namely a paper by Okoro et al. (2005) published in the journal Pediatrics. And I took data on homicide rates from the FBI's Uniform Crime Report for 2002 (the same year as the gun ownership data). As the chart below indicates, there is no relationship between the two variables: r = –.05 (p = 0.7, n = 50). I have previously noted that there is also little apparent relationship between homicide rate and gun ownership across countries. 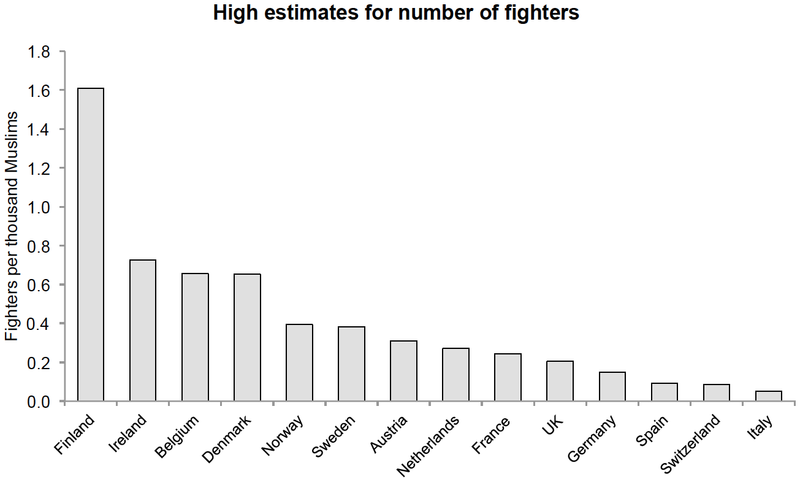 In my last post, I noted that fighters per Muslim is arguably a more appropriate measure of the number of fighters a country has sent to Syria and Iraq than simply fighters per capita. 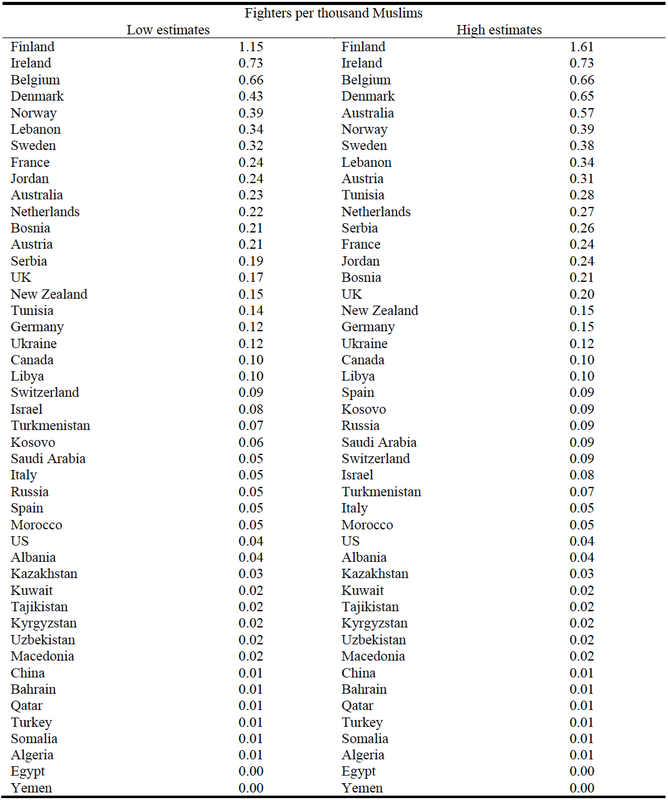 The table below gives fighters per Muslim for all the countries included in the ICSR dataset; countries are ordered from highest to lowest. Western European countries are noticeably over-repented at the top of both lists. Overall, the number of fighters per Muslim from Western European countries is about 5 times higher than the number of fighters per Muslim from non-Western European countries, and is approximately 2.3 times higher the number of fighters per Muslim from all countries together. Possible explanations for the over-representation of Western European countries at the top of these lists include the following. The figures are inaccurate; many of the fighters from Western European countries are not Muslims; many fighters from non-Western European countries have gone to places such as Libya or Yemen instead; Western European Muslims are richer and so can more easily afford to travel internationally; Western European Muslims are more radicalised; jihadist groups and rebel groups have been disproportionately targeting Western European Muslims; the relatively free press in Western Europe has given prospective fighters greater access to recruitment materials; Western European governments have been less stringent in interdicting those trying to leave. Which Western European country has sent the most fighters to Syria and Iraq? The generosity of the country’s social-security net has made people quicker to accuse immigrants of exploiting it. Meanwhile, a highly cohesive and demanding civic culture, which was the basis of Denmark’s liberal social-welfare policies, has alienated anyone who finds it hard to conform. This has made the country fertile ground for Islamist recruitment. Over 100 Danish jihadists have gone to Syria and Iraq, one of the highest rates per person in Europe. Indeed, the International Centre for the Study of Radicalisation and Political Violence estimates that 100-150 fighters have gone to Syria and Iraq from Denmark, corresponding to the second highest per capita rate in Western Europe after Belgium. Yet these per capita rates do not take into account the size of the Muslim population in each country, which is arguably a more appropriate denominator. Using population data for 2013 from the World Bank, and the fraction of the population estimated to be Muslim from Pew Research, I calculated the number of fighters per Muslim for each of the Western European countries in the ICSR dataset. The first chart uses the low estimates for the number of fighters, and the second chart uses the high estimates. 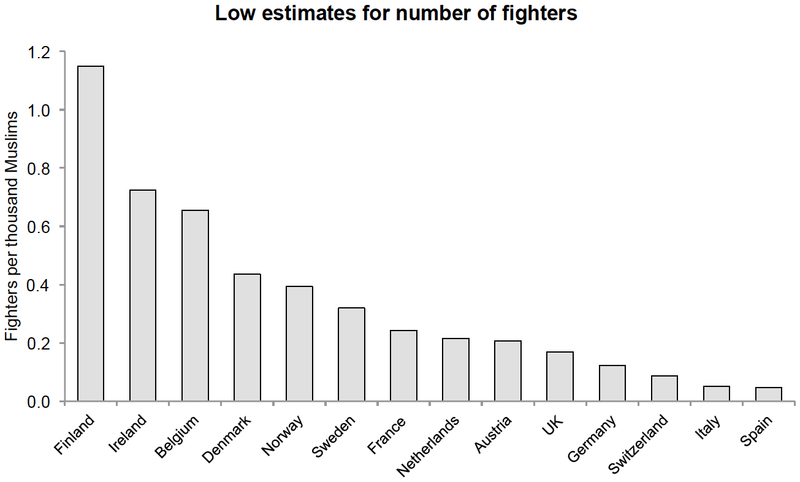 In both cases, Finland has the highest rate of fighters per Muslim, whereas Denmark has only the fourth highest. Thus, when the Muslim population is taken as the denominator rather than the total population, Denmark is seen to have sent slightly fewer fighters to Syria and Iraq relative to some other Western European countries, notably Finland and Ireland. And this is because Denmark has a larger Muslim population (4.1%) than both Finland (0.8%) and Ireland (0.9%). Several caveats are of course in order. First, the Pew figures on fraction estimated to be Muslim, which are form 2010, may be out of date. Second, an even more appropriate denominator might be the Muslim population aged 15-30, or better yet the male Muslim population aged 15-30. Third, although it is presumed that the majority of those who have gone to Iraq and Syria are Muslims, a small number are evidently not. Fourth, differences in the number of fighters across countries reflect factors other than how well integrated the Muslim population is; for example, how stringent the security services have been in interdicting those trying to leave. How has the global distribution of fertility changed over time? The chart below plots the global distribution of fertility (as measured by the TFR) in 1960 and 2012, using data from the World Bank. 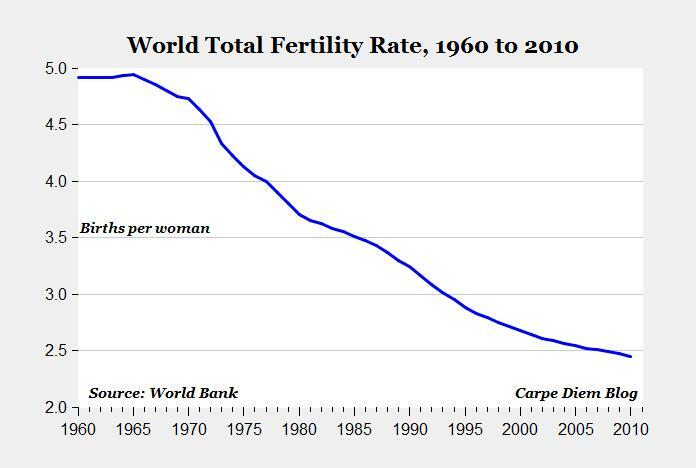 As is widely known, fertility has declined substantially over the last fifty years. In 1960, the median state was Albania, with a TFR of 6.2. In 2012 by contrast, the median state was Sri Lanka, with a TFR of 2.3. Nevertheless, there are still a considerable number of states with rapidly growing populations. 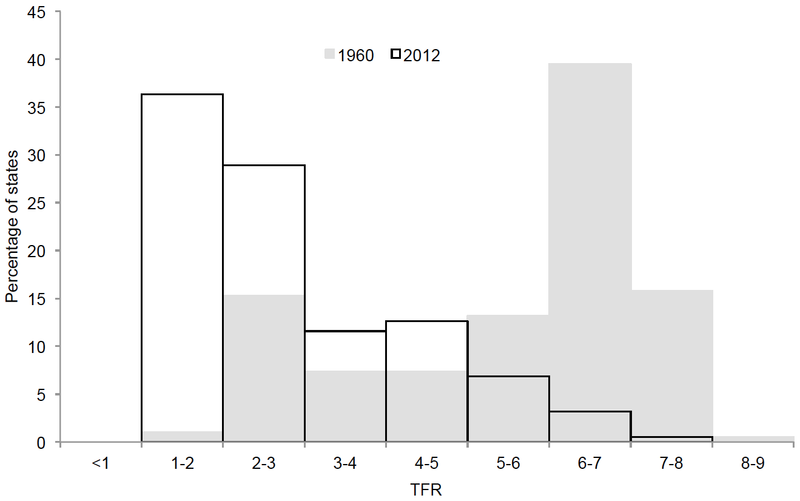 In 2012, 35% of states had a TFR greater than 3, 23% had a TFR greater than 4, and 10% had a TFR greater than 5. One particularly noteworthy case is Nigeria, which in 2012 had a TFR of 6 and a population of 169 million. At its present rate of growth, the country will be about as large as the United States is now by 2034. What do British business leaders think about the EU? The other day I came across a fascinating YouGov poll examining British business leaders' attitudes toward the EU. The poll, which was conducted on behalf of Business for Britain, sampled 1,024 business leaders in September of 2013. It achieved good representativeness with respect to region, and moderate representativeness with respect to firm size (large businesses were over-represented), industry (services were over-represented, construction under-represented) and exporting status (exporting businesses were over-represented). For further details on methodology, see pp. 6-7 in the report. The first major finding of the poll was that a sizeable majority of business leaders support holding a referendum over EU membership within the next few years: 66% were in favour of doing so, 26% were opposed, and 9% were unsure. This majority obtained for small, medium and large businesses, and for both exporting and non-exporting businesses. The second major finding was that a plurality of business leaders would prefer renegotiating the terms of Britain's membership to leaving the EU altogether. When asked how they would vote in a referendum over EU membership: 49% said they would vote to stay in, 39% said they would vote to leave, and 11% said they were unsure. The third major finding was that a plurality of business leaders think the costs of EU regulation outweigh the benefits of being in the EU: 46% said the costs outweigh the benefits, 37% said the benefits outweigh the costs, 8% said neither, and 10% said they were unsure. Interestingly, as the chart above indicates, small business leaders were more likely than large business leaders to think the costs of EU regulation outweigh the benefits of being in the EU. There are a number of possible explanations for this. First, small businesses may be less likely to export to the EU than large businesses. Second, EU regulations may be more burdensome for small businesses than large businesses. Third, small business leaders may be more opposed to the EU for reasons unrelated to regulation, such as being against European integration. You know it's an interesting thing if I look at the behaviour of business organisations. If I look at the NAM or the Chamber of Commerce, on any given issue they're as likely to be on the wrong side as on the right side. The only organisation that is almost always on the right side is the National Federation of Independent Business. Why? Because it represents small business. Why? Not because small businessmen are nobler than big businessmen. But because they know they can't get anywhere through government, while the big businessmen can.